A sold-out crowd on Sunday night at the Erwin Center clearly shared that sentiment. Though the audience members ranged from teens to retirees, the majority were fans who first bonded with Fleetwood Mac’s music through “Rumours,” the 1977 classic that eventually sold 40 million copies and remains the band’s touchstone. Indeed, 10 of the 24 songs in Sunday’s set came from the “Rumours” album. That included all of the first four songs: The bone-rattling, bass-driven “The Chain,” which allowed the anchoring rhythm section of bassist John McVie and drummer Mick Fleetwood to shine; the radio hit “You Make Loving Fun,” which put the spotlight on keyboardist-singer Christine McVie recent return to the band after a 16-year absence; “Dreams,” the Stevie Nicks signature vocal that topped the charts in June 1977; and “Second Hand News,” the irrepressible “Rumours” opening track that epitomizes the livewire kinetic energy guitarist-singer Lindsey Buckingham brings to the band. There’s perhaps less nostalgia in “Tusk,” the 1979 follow-up that wasn’t as hit-filled but took more chances, as a three-song passage shortly after the “Rumours”-dominated opening demonstrated. Stage lighting and back-screen images changed dramatically as Buckingham led the launch into “I Know I’m Not Wrong,” followed by the anthemic “Tusk” title track and the dark, mystical “Sisters of the Moon.” It was a brilliant turn toward one of the most fascinating passages of the band’s career. Buckingham dipped into 1987’s “Tango in the Night” to open a mid-set acoustic section, giving “Big Love” a fresh and illuminating solo treatment on a classical guitar. Nicks then joined him for a transcendent duo rendition of “Landslide,” the song that directly validated Browne’s reflection on how music reconnects you to a pivotal time and place in the greater arc of life. Indeed, if you first heard the song as a youth in the 1970s, there was no escaping the full-circle emotions that hung in the air as Nicks reached the line, “Even children get older/ And I’m getting older too.” And when she asked, “Can I sail through the changing ocean tides? / Can I handle the seasons of my life?” — those four seasons transposed into four decades, and the understanding that we all managed to handle them in our own way. The last stretch of the main set found the band losing a little bit of steam. Though the McVie-penned cuts “Over My Head” and “Little Lies” were welcome reminders of her return to form, Nicks’ drama-dripping “Gold Dust Woman” and Buckingham’s solo-heavy “I’m So Afraid” felt like indulgences. The defining rocker “Go Your Own Way” refocused the band as the main set ended, leading into a thoroughly delightful four-song encore that began with “World Turning,” in which Fleetwood took a deserved but thankfully not indulgent drum solo (with Buckingham seated at stage left taking it all in). Everyone sang along on “Don’t Stop,” the song that became a presidential campaign theme in 1992 and helped plant the seeds for the initial 1997 reunion of the band. “Silver Springs,” the exquisite “lost” track from “Rumours,” followed before stagehands wheeled out a baby grand piano so that McVie could close the show just as she had done at the Erwin Center in 1982, the last time she’d appeared with the band here. 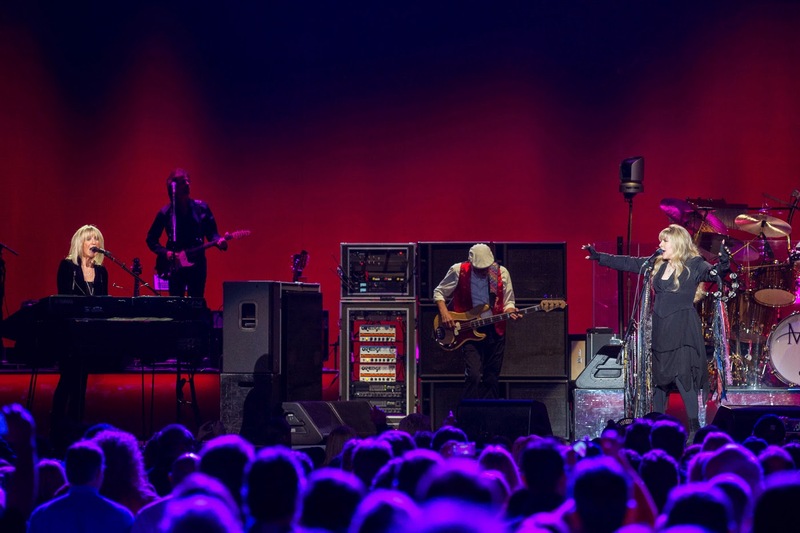 If ever an arena rock band made a convincing case for its own unplugged club tour, it was Fleetwood Mac Sunday night at the Frank Erwin Center. At the hour mark of an epic, 160-minute, 23-song show, a stripped down mini set cushioned the stillness and enduring beauty of songs known to all. Rockers age – musicians, compositions – but intimacy never grows old. At the collective age of 338, Fleetwood Mac – Mick Fleetwood, 67, John McVie, 69, Christine McVie, 71, Stevie Nicks, 66, and Lindsey Buckingham, 65 – creak where they used to coke, but the longer they cajoled the sold-out Red River Drum, now choked by the surrounding construction of UT’s Dell Medical School, the more convincing they became. By the end of the marathon performance, you could almost believe the group’s late-Seventies heyday had returned – no worse for the wear and tear. Opening with four straight tunes from their magnum opus, 1977’s Rumours, of which only two songs were omitted live, F-Mac’s shadow band couldn’t quite even out the headliners. Two auxiliary guitarists, three backup singers, and an unintroduced second drummer sitting behind Fleetwood’s gong augmented the all-star quintet, Nicks in elevated shoes and high heels to rival Seventies Kiss, which may or may not have explained stage moves best described as arthritic. When the band flubbed the opening to second song “You Making Loving Fun,” its author and singer, Christine McVie, shrugged helplessly across the stage to first guitarist Lindsey Buckingham. On the succeeding “Second Hand News,” Buckingham proved he’s still F-Mac’s spark, its bark and bite. Nicks’ voice, husky now where once it spooked smoky, shook off some rust on “Rhiannon.” Her sister of the moon in the band, McVie – returned after a nearly two-decade hiatus – proved best in voice, her vocal showcases “Everywhere,” “Little Lies,” and solo show closer on piano, “Songbird,” recalling her maiden name: Perfect. “A prophetic and profound new chapter in the band,” announced Buckingham in welcoming back the former Christine Anne Perfect, a sentiment later echoed by Nicks and Fleetwood. “Tusk,” featuring many horns and backing tracks not played live onstage – and accompanied by the best use of video graphics that throughout the show could only be termed screen savers – and album mate “Sisters of the Moon” bottled still-underrated Rumours follow-up Tusk. “Go Your Own Way” to close the main set never took flight, and the drum solo in “World Turning” came too late in the show. “Don’t Stop” transcended even the band given its political overtones of the last peaceful presidency this country has enjoyed in 35 years. At the heart of the evening beat five crystalline selections that surpassed the pomp of a classic rock concert. Buckingham’s solo acoustic delivery of “Big Love,” which then segued into a duet with Nicks on “Landslide,” and back out into his mostly unaccompanied “Never Going Back Again” brought a hush to even the FEC rafters. McVie’s stilling “Over My Head,” for which Fleetwood took to a stripped drum kit center stage, unearthed Rumours precursor Fleetwood Mac. Even then, Nicks’ Mirage marker “Gypsy” eclipsed the whole portion with a heartfelt reminisce of her roots in San Francisco’s mid-Sixties music scene – opening to Hendrix, Joplin, Santana, CCR – and a truly bewitching vocal. Remaining was an elongated, psych-tinged delve into her “Gold Dust Woman,” Buckingham’s trademark guitar showcase “I’m So Afraid” (also from Fleetwood Mac), and his searing solos on both. If Tusk remains under-appreciated, the guitarist’s preternatural ability on six strings is still criminally unheralded. No matter, really. I'm So Afraid - Amazing! !